Sometimes a vehicle comes along that makes your jaw drop. When it comes to the exterior of a vehicle, the 2017 Land Rover Range Rover Evoque breaks the mold. This model offers all the exterior features and amenities you’d want in a new model, from its design to its comfort. See below to learn more about what makes this model so special. Take one look at the Land Rover Range Rover Evoque, and you’ll see why this vehicle makes heads turn all around Baltimore. With multiple color and design options, the exterior of this vehicle allows you to match your own specific style and taste. 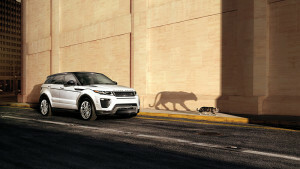 The Land Rover Range Rover Evoque is perfect for any Washington DC driver because it complements every style. Not only can you choose your own design features and colors, but you can also pick between three body style designs. You can enjoy more space with the five-door option, take in luxury comfort with the coupe option, or open up all the sights with the convertible. Basically, there’s a Land Rover Range Rover Evoque for you, no matter what type of vehicle you like. Efficiency is always important to Arnold drivers, and the exterior of this model increases this vehicle’s efficiency. For starters, the material used to construct this new model is lightweight, allowing it to breeze through the air when necessary. IN addition, the laminated windshield helps to reduce the weight of this vehicle, making it the lightest Land Rover available today. Because of this, you can expect this model to deliver an impressive amount of fuel efficiency, so you can enjoy more road and less gas pumps. Sometimes a vehicle can give you extra features and amenities that make it stand out, and that’s what the Land Rover Range Rover Evoque will do. For instance, this model includes power-fold heated exterior mirrors, which makes it easy to stay warm on a cold day. In addition, the rain-sensing windshield wipers automatically turn on when water is sensed, allowing you to pay more attention to the road and let the Land Rover Range Rover Evoque worry about safety. The Land Rover Range Rover Evoque offers plenty of features and amenities that any Baltimore driver would love, and the exterior is just one of these features. With a sculpted look that gives you multiple design styles and plenty of features and amenities that allow the vehicle to stand out among others, this is one for the books. Visit Land Rover Annapolis today at 101 Ferguson Road in Annapolis to see our inventory; contact us online to apply for financing; or call us at 410-907-8300 to learn more.